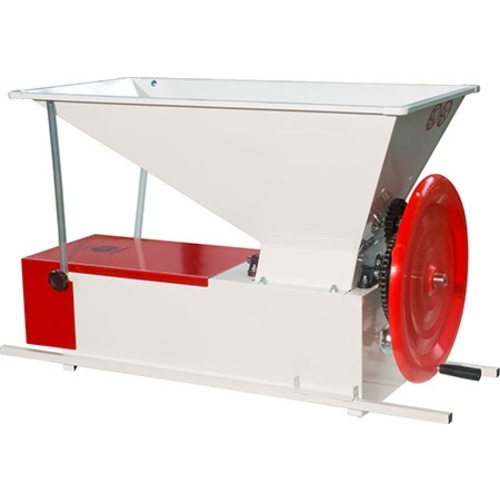 This hand-cranked Crusher/Destemmer is perfect for the home winemaker processing small batches or is working in conjunction with friends who don't mind a little manual work! As the unit is cranked, the grapes are pulled by the agitator into the rollers where first the grapes are crushed. Next, they fall into the stainless basket where a rotating shaft with paddles separates stems from grapes. The crushed and de-stemmed grapes then fall through the basket while simultaneously the stems are pushed out the end and into a refuse can. All of our units feature removable easy-to-clean stainless baskets (grates) where the grapes fall through after having been crushed. Imported from Italy from Enoitalia. I owned one in the 70s. Works well. Very affordable for our home vineyard. I've used it before and it works great. Availability and ease of ordering.